Here at Elite Strength Labs, we wanted to create a hemp product that our customers could access without paying an arm and a leg. We got our team together and came up with a premium formula that offers hemp oil that is affordable and made with the highest quality in mind. The best supplements on the market are made with natural ingredients, there's no question. That's why we decided to go with only natural hemp and peppermint oil in every bottle. You can rest easy knowing that you're going to get an all-natural product with no frills or fillers. Each bottle of our hemp oil comes with a 30 days supply. You can rest easy knowing that you will not run out through the month. Considering that you can take up to 2 servings a day - there is no doubt true value here. As always, our products are all made right here in the United States. We want to deliver quality products to all of our customers for years to come, that's why we use FDA approved facilities to bottle and package all of our products. 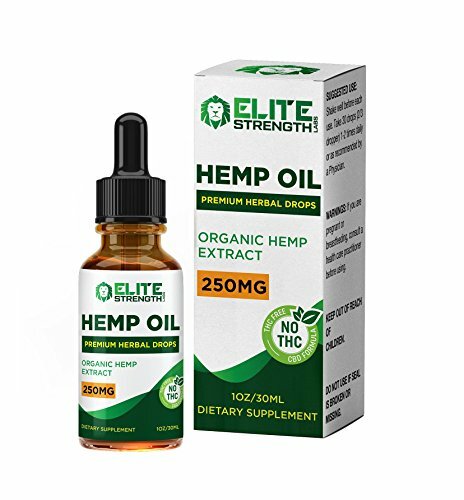 Heart Healthy Hemp Oil - Here at Elite Strength Labs, we understand the importance of a healthy heart. Our formula contains Omega 3 and 6 fatty acids -- which contribute to heart health. Promotes Calm & Relaxation -. There are plenty of ways to relax at the end of a long day. Our hemp oil is known to promote relaxation and give you a sense of calm, even when life gets hectic. Natural Ingredients - We don't mess around with fillers and artificial flavors. You will ALWAYS find natural ingredients in every single one of our supplements, and hemp oil is no exception. One Month Supply - Every bottle of hemp contains a 30 day supply. You can look forward to having a steady supply of this great supplement with every purchase. Stock up today! Made in the United States -.All of our products are proudly made in the USA! We also us FDA approved facilities to help delivery quality and consistency that you can trust. If you have any questions about this product by Elite Strength Labs, contact us by completing and submitting the form below. If you are looking for a specif part number, please include it with your message.